Good posture is simple and eloquent by design in form and function. The body is designed to have the head, rib cage, and pelvis perfectly balanced upon one another in both the front and side views. If the posture is deviated from normal, then the spine is also deviated from the normal healthy position. Unfortunately, abnormal posture has been associated with the development and progression of many spinal conditions and injuries including: increased muscle activity and disc injury, scoliosis, work lifting injuries, sports injuries, back pain, neck pain, headaches, carpal tunnel symptoms, shoulder and ankle injuries as well as many other conditions. Additionally, postural abnormalities in adolescent years have been recognized as one of the sources of pain syndromes and early arthritis in adulthood. 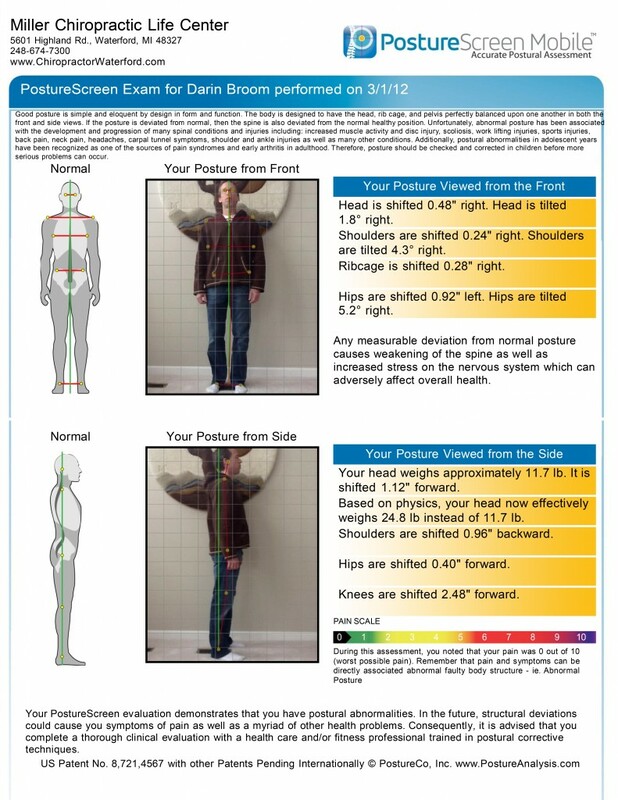 Call the office today to schedule a posture analysis with Dr. Miller. (248) 674-7300.